Keep your kitchen organized and everything in its place with the Kitchen Baker’s Rack from Whitmor. This rack is perfect for storing your pots and pans as well as your other cooking utensils. In addition there is a wood cutting board that is included. Kitchen Baker Rack Features Easy no tool assembly. Durable chromed metal construction. Wood cutting board included. Great for your kitchen or even for use in the garage or office. Four accessory hooks included. Shelves are adjustable in 1″ increments.. Whitmor is a 4th generation family-owned and operated business. Since 1946, Whitmor has been dedicated to bringing organization home by creating products that simplify everyday life. Ensuring that those products are built with integrity, value, and innovation is our commitment to you. And our promise is that we will always be here for you should you ever need us as we stand behind our product 100%. Whitmor customer service is available in English and Spanish Monday through Friday from 8am – 4:30pm CST. Call us and we will gladly assist you in your language. Whitmor customer service Department, 1-888-944-8667 or customer_service@whitmor.com. Whitmor’s easy, no tools required rack looks great & adds function to almost any space. Included are chrome hooks to be used for extra storage of hanging dish towels, pots, pans and more. 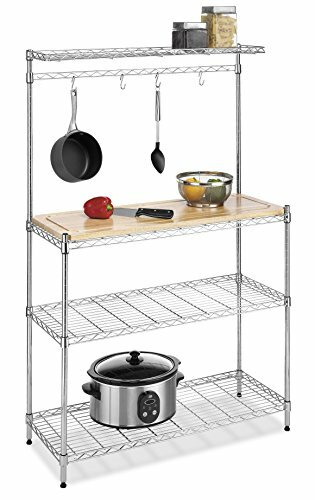 Shelves on rack adjust in one-inch increments to accommodate various sized cookware. Removable wood shelf can be used like a butcher’s block or for appliances & cookware. Love this This rack is perfect, it’s sturdy easy to assemble and looks amazing. It holds a lot and really helps organize the kitchen. The bar across the top is a great touch, it allows for hanging pots or utensil. Must have for kitchen If you have the space, buy this.